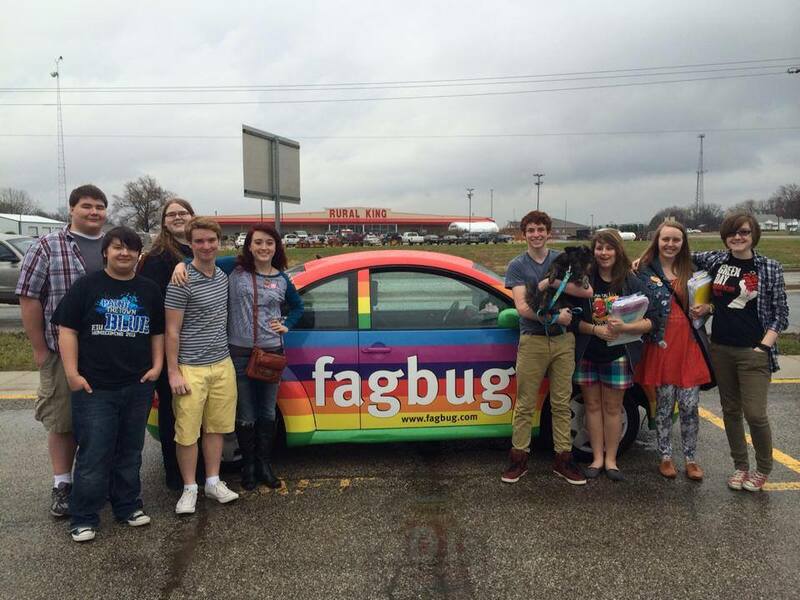 Members of the CHS gay-straight alliance pose with the Fagbug. I remember this argument. In 2008, I was part of an effort to bring the Fagbug to my (now) alma mater, a small Catholic university two hours west of Charleston. As a sophomore I had helped to resurrect that school’s defunct GSA. I’d sat in the dorm lobby, with my handful of fellow members, and made buttons for National Coming Out Day and the Transgender Day of Remembrance, — one hand-cut circle, plastic dish, and pin-back at a time. My best friend heard about Erin on NPR and suggested we invite her to campus, to speak and to screen Fagbug, her then unfinished film. I doubted our $250 of start-up funding would come close to paying her bill. But we pursued it anyway. And I learned quickly how many more non-monetary barriers stood in our way. I remember being asked about the word ‘fag,’ to explain (to our unidentified detractors) why we needed to use it. In one of the many letters I wrote that semester, I explained what I should never have been expected to explain: that there is a strong history in social justice movements of reclaiming slurs, from the n-word to the sexist and ableist c-words, to terms like “fag.” That not everyone who identifies as a member of these oppressed groups will participate in (or support) this practice, but that — regardless — context matters. The word “fag” on a rainbow car, side-by-side with the GSA’s logo, carries a different meaning that it does when a homophobic classmate launches it across the dining hall. In our case, the dining hall scenario (and its brethren) had yet to be addressed. Policing our use of the word without taking issue with it in an explicitly homophobic context could not stand. Thankfully, things at CHS appear at least a degree or two further along; Principal Hutchins’ statement that the administration has received “direction from the GSA in the past” regarding the slur warrants some small optimism. Although the students (again) should not bear the responsibility of educating those in power, at least the powers-that-be are (apparently) receptive. Yet Hutchins asked Erin to move her car. Our higher-ups asked us to promote the event but lose the word. Their students rallied. We wrote another letter. I’m not trying in any way to stop what they are trying to do. That’s not the statement of an opponent, but it’s also not the statement of a supporter. A supporter says We are doing this, together. A leader says the same. Discrimination based in ignorance, rather than hatred, still does harm. Well-meaning administrators like Hutchins see the potential firestorm in events like Fagbug and attempt to toe the line of compromise: Of course we support gay students, but we cannot make exceptions. Erin can stay, but her car cannot. You can host the event, but you can’t use that word. At my alma mater, they created a new piece of paperwork, requiring organizations hosting “controversial” events to spell out how they would allow space for dissenters. To my knowledge, only the GSA was ever required to complete that form. These kinds of double standards are framed as compromises, as tolerance, acceptance, and support. Hutchins calls them “bending over backwards.” But the decision not to oppose oppressed students on your campus does not constitute support. Protecting the safety of your students wins no medals; it’s basic, level one. Having a statement, like my university did, like CHS does, stating that students have a right to be on campus (and free from bullying) regardless of sexual orientation or gender identity, is step one. The next step, the next thousand steps, is living up to that promise. When you welcome a group onto a campus, you do not invite them to sit silently in your space. You invite them to walk freely and to speak openly, using the words they choose, about the problems they face. You allow them to create change on that campus. And you join them in creating that change. By far the best thing that came out of my own Fagbug firestorm was the wave of visible support from faculty, staff, and students. The event, which we did finally manage to hold, was easily our best-attended. Folks on campus went to the mat for our right to bring Erin in, and made it clear that they would continue to do so for future GSA offerings. Those alliances paved the way for the safer, more hospitable climate that’s developing there today. I have hope that yesterday’s events at CHS will likewise reveal their allies and lead to similar growth. I hope they will lead to administrative support for gay, bi, and trans students on that campus and elsewhere. As importantly, I hope the administrators in question will not view that support as a favor to queer students. It isn’t a favor. It’s the fulfillment of an existing promise. It is the least they deserve. 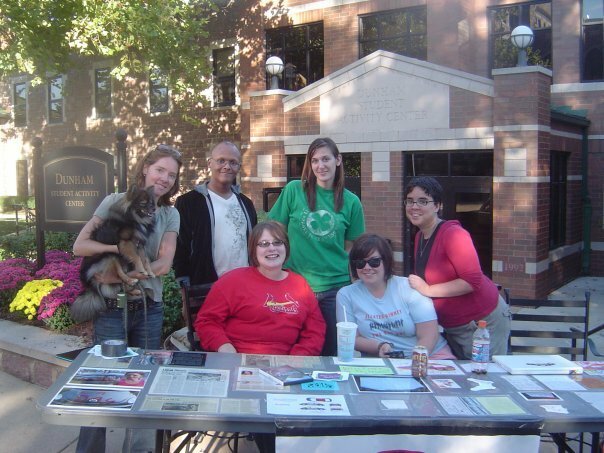 Members of our GSA with Erin Davies, 2009.